Georgie was one of our top five tips for 2016, but she's had a relatively quiet year up to now, but that's about to change with the release of her debut single Company Of Thieves and her October and December tour dates with Jake Bugg and the omnipotent Blossoms that will catapult her into the spotlight and in all likelihood into all manner of sound of 2017 lists. The song itself justifies the nomination we made on its own. It's a vitriolic rant at an ex-lover that makes her bitterness clear from the very start "did I come to your flat with a sign on my back saying screw me over, did you think we were friends while you made your plans for me to discover", a theme that continues throughout and one that's delivered with her strong distinctive and impactful vocal that means business and makes her stand out from the crowd. 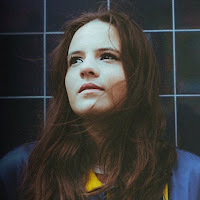 There's elements of 60s tinged pop, soul and blues in the song that point in many different directions for what we can expect from her in future. She's been recording her debut album at Spacebomb Studios in Richmond, Virginia in the US ready for a 2017 release. Georgie's official website can be found here and she is also on Facebook and Twitter.